Te Māori returned home as ‘Te Māori-Te Hokinga Mai’, 1986-1987 to tour the National museum in Wellington, Otago Museum, City Art Gallery, Christchurch and Auckland City Art Gallery. The exhibition consisted of 174 taonga from different tribal areas that were in N.Z museums throughout the country. 38 taonga came from the National museum, now Te Papa. Several of these taonga are now on display in Toi Te Papa, which feature the significance of Te Māori in terms of the (re)perception of Māori art. Te Māori is widely acclaimed as an exhibition that changed the way that museums and art galleries interpreted and managed taonga Māori. Of importance was the acknowledgement that there was a living cultural dimension to Māori ‘artefacts’ held in their collections. This was a paradigmatic shift in museology that was also reflected in the wider context of Māori educational and political activism of the 1970’s and 1980’s. Many Māori who currently work in museums and art galleries have, in some way, been influenced by Te Māori. A personal experience was in 1987, when the exhibition returned to the Auckland City Art Gallery as one of the homecoming venues after its successful tour in the United States. 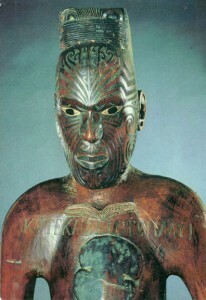 I came ‘face to face’ with an ancestor, Te Kauru o Te Rangi. Te Kauru fell at the battle of Te Pakake in 1824, along with other close relations and important chiefs of the Hawke’s Bay region of Heretaunga. Te Kauru, his father Te Hauwaho, uncle Te Humenga and cousin Pouamate, all died in this battle. They were later represented in perpetuity as poutokomanawa, ancestral carvings or centre ‘posts’ for a tribal meeting house, now residing on display in the Hawkes Bay museum and Art Gallery, Napier. For the families associated with these taonga, agreeing to Te Kauru travelling as part of the Te Māori exhibition was quite a momentous decision. There are a number of poutokomanawa, of related style and age, in museums throughout the world. One day they may come together, if not physically, perhaps digitally-for all their descendants to learn about and appreciate. Like many Māori, I imagine that Te Māori was a unique and important event when we as descendants became absorbed and embraced by the presence of our ancestors. I certainly know that the exhibition had a lasting and profound effect on me, and some of my other whanaunga (relations), enough to encourage us on a life long journey learning about our heritage and genealogy. Tena ra koutou. My name is Wikitoria and I have since found that my gr8 gr8 karani was PURU TE KAURU m. TATU HOROPAPERA. Does anyone know this Tupuna Whaea and what line Te Kaura she descends from? I have the names HOHEPA TE KAURA m. MAATA KAHUIMANU TE HANENE…Tupuna born before 1896…these appear to be the parents of TE AIHURANGI HOHEPA TE KAURA b.1869…could Puru be his sister to above? Thankyou in advance for any help. I think you are my Uncle as i am ross wilson oldest daughter, Angela. Great Great Grandmother, she married John Campbell Senior. who married my grandfather Walter Murray MacGregor. I’d like to hear from my long lost relations to compare whakapapa’s as this is the line that I’m working on at the moment. I’m so sorry that I miss out on this reunion, but maybe next time. My e mail is pcampbell@paradise.net.nz. I’ve just come across this site and am smiling at all the cuzzies who have made contact. However,Te One, you are the one with whom I would like to talk with about our tipuna Hopaea Te Kauru.The others I will (hopefully) see at the reunion, except Karen who I understand is overseas.So would you contact me asap? Would you by any chance have had a sister Arlette Josephine Brown (nee Maaka)? Hi Kylie… James Yorkie Wilson married Horiwia Te Ihurakau. One of their sons was Wiremu Kaimoana Wilson who had a son James Paetai Kaimoana Wilson – he had a son Paetai Jnr who was alos known as Dice. Yes, Tracy Rongomai is correct in saying that Te Aihurangi became known as Hohepa also Hohepa Smith is another. My grandmother was Horiana , Aunty Keitas younger sister and Aunty messines(Mussie’s) older sister. She married my Grandfather the Very Rev John G Laughton. My Grandparents had 5 childern, Mary, John , Jean , Kathleen and James. I am the oldest daughter of Kathleen who married Keith Cameron. I had the good fortune to meet most of my Grandmother’s Brothers and sisters before they passed away. jus wondering glen..my grandfathers name was Rameka Te Kauru and his father was hohepa Te Kauru jus wondering if know anything or my koro brothers and sisters cause he left nuhaka wen he was young??? So thanks and does anyone hav any info on the other Te Kauru o te Rangi. Wud love to hear more.. Thank you for your email. Very interesting to share whakapapa. I’ll have to ask my whänau further to this. Ngä mihi ki a koe. Just woundering if Stormy descends from the same Te Kauru O Te Rangi (The Treaty signee) that I descend from as he is not the same that was sent with the ‘Te Maori’ exhibition. Ko Wai Tirohia te awa. Ko Ngati Te Rangi te hapu. Tena koe whanaunga Glen Wow its been 6 years now since i first posted on here and since then have discovered a little bit more of who i am 🙂 thank you so much for you input. Grandpa Dempsy was her only issue. I do have a question to put out there? Just wondering if Heeni Campbell is of the same Campbells from the east coast? Well actually if both of them were from up there? I have seen the signature of a Chief Te-Kauru-o-te-Rangi on the Treaty for the Tairawhiti district. Can anyone help? Sorry just s correction to my last post. Thank you for your email. Te Kauru-o-te- Rangi was the son of Te Hauwaho and Hineiaia. I’m not sure if Te Kauru had children before he died at Te Pakake. I descend from Oneone, who was coming back from a tangihanga by waka with his children Taihoa and Tärehä (my great-great-great grandfather)when they saw the pa of Te Pakake being taken. Contact me at Te Papa and we can talk further.